March 20 will be a day of celebrations. Why? Because on that day, at 10.28am, the Sun crosses the Celestial Equator – hooray! Wait, what on Earth does that mean? It’s just another way of saying it’s the Vernal Equinox and the days will be longer than the nights. March is the best time for viewing my favourite constellation, Orion. Dominating the southern sky as soon as it gets dark, it is unmistakable with the three stars of his belt easy to find. Let’s take a little trip around this giant of the skies. Top left is the unforgettable bright orange Betelgeuse, the largest star in the sky (nearly). It’s almost five hundred light years away and pulsates gently as if it’s getting ready to explode in a supernova. On his other shoulder, we find Bellatrix, the Amazon star, at just about half the distance. Although it has a bluish tinge, it is thought to be running out of fuel and will start to slowly turn red (well, who wouldn’t?). Bottom right is Rigel, another famous star, very bright despite being twice as far away as Betelgeuse. Bottom left is Saiph, the forgotten relative of the group despite it being another giant star, again with a bluish tinge. Now, those three stars of his belt. They are, from left to right, Alnitak, Alnilam and Mintaka – or are they characters from a children’s cartoon? Anyway, the point is that they are much further away than even Betelgeuse, probably twice as far, so you can see that the major stars of Orion really have nothing to do with each other at all! Now, hanging from his belt (apparently) are three stars, whose light has taken one thousand five hundred years to reach us. illuminating it and giving us the Orion Nebula, one of the most stunning sights in the night sky. Try looking at it with binoculars. This cloud is clumping together and if you sat and watched for long enough, you would see new stars forming in front of your eyes. I must point out, however, that it takes millions of years, so best take a chair and book a lot of time off. Just below and to the left of Orion, by the way, is the brightest star in the sky, Sirius, actually part of Orion’s hunting dog. I mention this because this star is really close at a mere eight light years away. So you can see, even his dog is nothing to do with Orion. Elsewhere in the sky, above Leo, to the left of Orion, comet 41P/Tuttle-Giacobini-Kreak (I know) will track north during the course of the month, through the Plough, and may become bright enough to see without binoculars. Due on the 19th is the launch of an ATK supply vessel to the ISS, worth looking out for; as is the launch of a new crew aboard a Soyuz at an unspecified date. Check on http://www.heavens-above.com to see if either are visible. 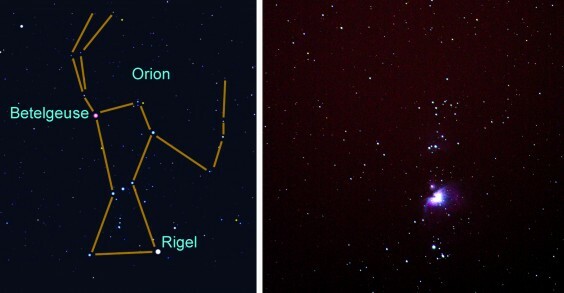 Above: Orion constellation and the Orion Nebula.